The search for low sounds in the universe of found instruments is always a challenge. It usually means finding something big, like long lengths of PVC pipes, which can be difficult for touring. For bottle sounds, the depth and low range of the perfect gallon jug is worth the trouble of collecting, cleaning, and carefully transporting. The range of a glass cider jug extends below a wine bottle or an old vinegar jug. It takes an enormous amount of air to produce a good clear sound. And to get enough air, one needs to take deep noisy breaths. But this is actually a bonus, because the sound of the in-breath just before the articulated note, can form part of the music. The in-breaths are quite audible, especially when the mics are close and hot. So using this sound will be an interesting way of allowing a natural percussive line to be heard while producing the pitched sounds from tuned blown jugs. 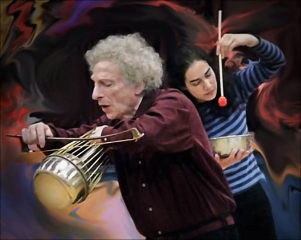 The real breath sounds produce a sense of necessity and energy in the music. This technique is used in the song “Why Don’t We” from the album “Whisper in My Ear”. Another recording session: different room, different sounds. This time at The Farm Studios (once Vancouver’s Little Mountain Studio). 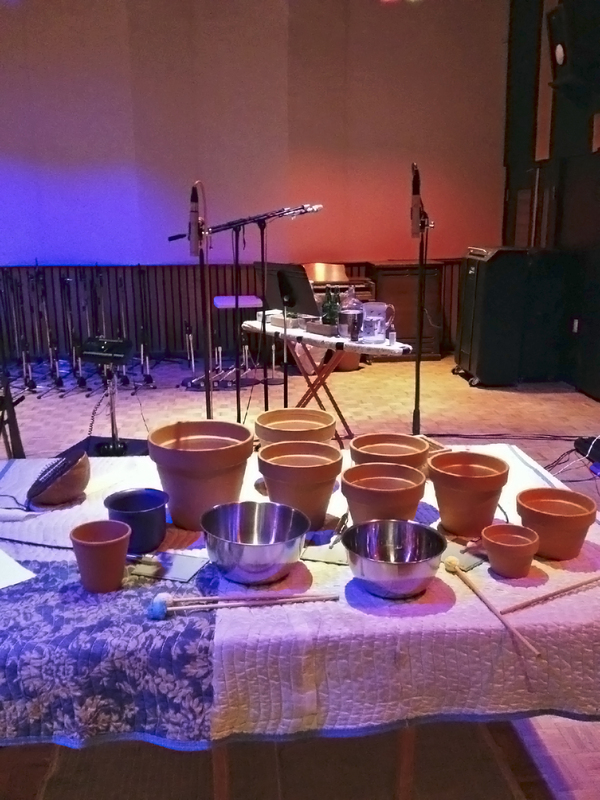 The room was smaller and less resonant than our first session and for some of our sounds, especially clay flowerpots, this allowed for a more distinct recording, the sounds of the pots more precise than if they were in a more reverberant setting. The placing of PZM mics on the table between the pots proved to be the best way to capture the special sound of struck clay. Completed another two songs. Gathering momentum. We load into the studio early in the morning. Beginning a recording session we have been preparing for many months. Waterphones all cleaned and ready.